Updated Friday March 29, 2019 by Gloucester Lacrosse Association. Schedule: Will be posted later this summer. All teams are guaranteed a minimum of 3 games. Cheques can be made payable to: Gloucester Minor Lacrosse Association. The tournament application form is attached at the bottom of the webpage. Once both the fee and completed application forms have been received, confirmation will be issued to the team contact via email. 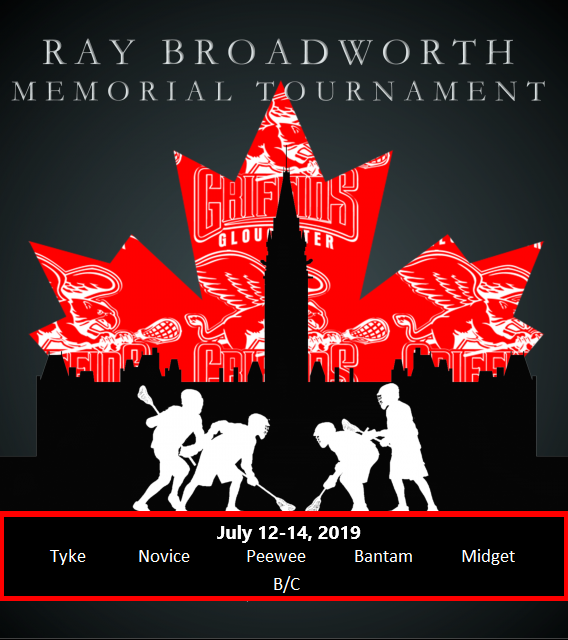 Team rosters must be submitted to Tournament Director by June 12th, 2019. Teams wishing to withdraw from the tournament have until June 12th, 2019 to request a refund. No refunds will be issued after that date. Our tournament draws teams from across Ontario, Quebec and the US North East providing OLA based teams the opportunity to play against a wide variety of competition. As per OLA policy, games played against non-OLA teams will not count towards an OLA teams ratings score in MyLaxRankings.com. When drafting the schedule, consideration will be given to the distance teams must travel; however, no guarantees can be offered. The tournament schedule will be posted closer to the date of the tournament. Please note that the Tournament Convenor reserves the right to modify the tournament schedule or format in the event of unusual or unforeseen circumstances. Accommodations: Please use the link below to book rooms for the tournament.